Mark Kamau grew up in Kenya dreaming of playing for Manchester United. He made it to the national level but after only three weeks, he realised the team were not going to get paid and he was forced to quit. Thankfully Kamau was no one trick pony and discovered that he had a knack for technology. He gained experience in Berlin and Amsterdam before establishing a human-centred design lab at the iHub community in Nairobi. It helped local start-ups focus their products on end users, and picked up consultancies with multi-nationals such as Google, Intel and MasterCard. Eventually though, Kamau wanted to get his own hands dirty and joined BRCK as UX design lead so that he could channel his belief that “design is the most powerful tool to transform Africa” into developing products fit for the continent. Among the company’s recent innovations are the SupaBRCK, a robust, self-powered router that provides connectivity and acts as a server for locally cached content, and Kio Kit, a digital classroom comprising tablets, a SupaBRCK and wireless charge point all contained in a sturdy “Africa-proof” case. So it’s safe to say that the Premier Division’s loss is the world’s gain. Nataal met Kamau at Design Indaba 2018 to find out more. What is your definition of human centred design within the African context? It’s about engaging African intelligence and not treating Africans as recipients of design but rather designers themselves. You design with them, not for them. It involves a lot of empathy and taking the time to understand their nuances, needs and aspirations. Why do you think Kenya has become such a hot spot for tech innovation? We unfortunately have a lot of challenges with infrastructure – banking, medicine, connectivity and so on. But we also have a vibrant population who want to do something about it rather than wait for the government. That attitude, plus more and more examples of people who are doing great things, is inspiring the young generation to embrace technology. What were some of your learnings while developing the Kio Kit. One of the most beautiful things was studying the mind of a young child. For example, to begin with, we gave the tablets these black, sleek buttons but the kids couldn’t turn them on. But then we worked out that they viscerally responded well to colour and experimented with an orange button instead. To date I’ve never been in any corner of Africa where a child could not turn it on. These little changes are brilliant. There must have been some pretty emotional discoveries, too. I could talk for a day about seeing children light up using the Kio Kit. There was this library in a conservative Muslim community that had books about menstruation and puberty, but the girls could not pull them off the shelves because it was taboo. So we put digital books on the Kio Kit and after that a girl came up to me and said ‘Now I can read any book because the back of the tablet looks the same for every book’. Things like this are magical. Has the huge uptake of the Kio Kit surprised you? We launched it two years ago and now it’s in countries we didn’t think would ever need them, like Germany. It makes you realise that these are human problems, not African problems. We always find other people who need the same solutions. And that opens up this space for African kids to see African innovation going out into the world. It debunks the assumption that technology can only come from China or the West. They can dare to dream too. For me that change of mind-set is the biggest driving force. Growing up, the environment wasn’t conducive to feeling self-determining. I wouldn’t want that for the next generation. 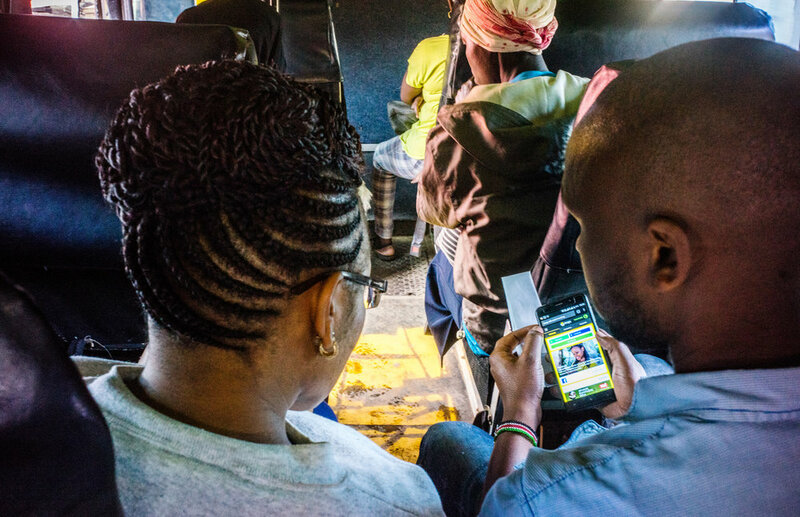 Our ambitious goal is to connect the whole world to the internet – right now there are 3billion people in frontier markets who need to come online and 800million of those are in Africa. We will grow the network as big as possible and we are looking at different applications too. What Kenyan start-ups are you excited about at the moment? There are many young girls who are taking over right now. I mentor at the leadership incubator Akili Dada, which teaches girls end-to end-design and gives them capital to launch businesses. I help them to contextualise and market their ideas. There’s a group there called Akira Chicks that takes girls from disadvantaged backgrounds and teaches them how to do coding and then connects them to jobs. This transforms their lives because it means they can support their families and themselves.